Developing new antimicrobial treatment strategies is becoming a key challenge in today's medical research. The targeted delivery of drugs into infected human tissue could significantly improve the antibiotic therapies to combat difficult-to-treat microorganisms. The Junior Research Group Biogenic Nanotherapeutics at the Helmholtz Institute for Pharmaceutical Research focuses on naturally occurring nanoparticles – extracellular vesicles – as possible natural carrier systems for antibiotics. Bacterial infections have increasingly become a challenge for today's health systems. In recent decades, the number of resistant and difficult-to-treat germs has steadily been on the rise. This has led the German federal government to give the fight against such bacteria the highest priority by adopting DART 2020, the German Antibiotic Resistance Strategy. It is estimated that up to 15,000 people die of resistant bacterial infections each year in Germany alone . At the same time, fewer new antibiotics are being developed, increasing the need to make existing antibiotic drugs more effective. A promising approach is to encapsulate the antibiotics in drug carriers such as nanoparticles. Such active substance carriers can transport antibiotics to the site of action with greater precision and thus reduce their typically occurring side effects, such as diarrhea or renal toxicity. At the same time, the nanoparticles are supposed to interact specifically with the targeted microorganisms, release their antimicrobial cargo and thus increase therapeutic effectiveness . Fig. 1 Active substance carriers based on the principles of nature. In contrast to purely synthetic drug carriers, biogenic systems are isolated from nature or used according to nature's principles. Such systems can be semi-synthetically modified to optimize the interaction with target pathogens. (Figure from  reproduced with permission, Copyright (2018) American Chemical Society). Most currently used drug carriers are based on synthetic polymers or lipids. Due to their artificial origin it remains unclear whether these are suitable for long-term therapies. It has been shown in targeted drug delivery for cancer therapy, for example, that after repeated administration the human body produces antibodies against certain nanoparticulate systems, leading to their rapid removal and thus a loss of effectiveness . The Biogenic Nanotherapeutics (BION) group at the Helmholtz Institute for Pharmaceutical Research in Saarbrücken (HIPS) is therefore working on new, naturally occurring drug carriers that are both physiologically tolerated and efficient at fighting bacterial infections (Fig. 1) . 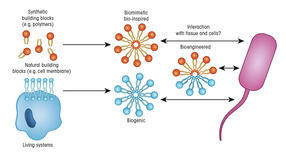 Extracellular vesicles (EVs) are nanoparticles that are produced by cells under physiological conditions to convey the exchange of signaling molecules between different cell types and tissues. Almost all cells examined so far produce EVs. It has also been shown that, depending on the parent cell, some EVs interact very selectively with a particular type of target cell. Such specific interactions make EVs promising transporters for directing active substances towards their intended site of action. In contrast to synthetic nanoparticles, EVs possess a natural composition and thus an increased stability and better biocompatibility in physiological environments . For efficient antimicrobial therapies it is also advantageous that the EVs of some cells themselves possess antibacterial properties. Combining the natural features of EVs with the therapeutic properties of established antibiotics would create nanocarriers that specifically target bacteria, thereby enabling new approaches for therapies against infections. However, to use EVs as drug carriers, it is essential to develop larger scale production techniques, effective loading methods and to analyze the EVs’ storage stability. When developing nanoformulations, freeze drying (lyophilization) plays an important role for the storage as a drug. Freeze-dried drug carriers are easier to transport because they do not need a cold chain. They also offer more flexibility regarding the suspension medium. Although the International Society for Extracellular Vesicles (ISEV) recommends the storage of EVs at -80 °C, it is unclear whether this really does preserve the biological activity of the vesicles any better in view of the additional equipment and electricity costs. 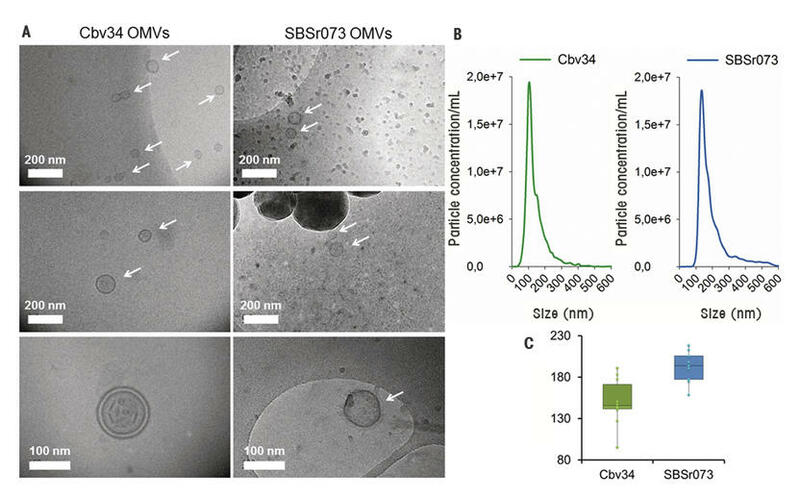 To shed light on this, EVs were isolated from different cell types and their stability studied under various storage conditions: at 4 °C, -80 °C, room temperature and after lyophilization . The EVs were isolated by ultracentrifugation and then purified using size exclusion chromatography, which separated the EVs from insoluble protein aggregates that might interfere with the analysis. Under none of the conditions did short-term storage of the EVs result in any substantial loss of particles or a change of their mean size. This seems to indicate an inherent stability of the EVs. To assess the biologically relevant activity of the EVs, they were loaded with the model enzyme glucuronidase. The loading stability was studied by asymmetric flow field flow fractionation (AF4). AF4 is a separation method for the fractionation of substances and small nanoparticles, performed in a chamber exclusively by different longitudinal and transverse flows. Because there is no stationary phase with which analytes can interact, AF4 is a relatively mild method and often used in biological research. Although the lyophilization of enzyme-loaded EVs led to an almost complete loss of glucuronidase activity, this effect could be reversed by the addition of so-called cryoprotectants (Fig. 2). Cryoprotectants are small sugar (trehalose, for example) or polymer molecules that protect the EV membrane from damaging ice crystals when being frozen, thereby improving the EVs’ integrity. In fact, adding 1–4 % trehalose to the EVs resulted in an enzyme activity comparable to that of the positive control (glucuronidase-loaded liposomes). Such fundamental studies give us important basic knowledge for the further development of EVs as potential drug carriers. Bacterial vesicles: Biocompatible as well as antibiotic? Not only mammalian cells produce EVs. Bacteria use similar nanocarriers to exchange information within a colony or with neighboring cells. Gram-negative bacteria bud off these so-called outer membrane vesicles (OMVs), which can play different (patho-) physiological roles. It is known that pathogens use OMVs to transfer resistance genes or to manipulate host cells . However, these OMVs are unsuitable as drug carriers as they themselves would be virulent. Myxobacteria are better suited. These are soil bacteria that can exhibit swarming behavior and attack other microorganisms in the battle for biological niches. However, they are not pathogenic to humans while producing a large number of natural compounds with antibiotic properties . If the myxobacteria loaded their antibiotics directly into the OMVs, these OMVs would constitute fully-fledged drug carriers . The OMVs from two representative strains – Cbv34 and SBSr073 – were isolated and their size and morphology analyzed by cryo-electron microscopy (Fig. 3). 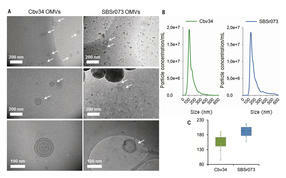 Although OMVs are only 150 nm in size and thus smaller than mammalian particles, they were stable after lyophilization even without the addition of cryoprotectants. For potential therapeutic use, nanocarriers should be as biocompatible as possible and not stimulate the immune system. Interestingly, neither OMV type showed any negative impact on A549 epithelial cells and THP-1 macrophages. Although these in vitro assays are very simple tests that do not simulate the complexity within a living organism, they do provide a first indication that OMVs may possess good compatibility properties. To study the antimicrobial effect of OMVs, their growth-inhibiting effect on the model bacterium Escherichia coli was investigated (Fig. 4). While the OMVs of the SBSr073 strain were shown to have only a slight bacteriostatic effect, those of Cbv34 proved fully bacteriostatic in a dose-dependent manner. This effect was due to a natural product called cystobactamide 919-1, which was identified by mass spectrometry to be present in Cbv34 OMVs. Cystobactamides are potent inhibitors of bacterial topoisomerase, an enzyme responsible for the spiraling of DNA . Unfortunately, the amount of drug per OMV could not be quantified because the background signal of the vesicle lipids was too prominent in the mass spectrogram. A deeper analysis of the antibiotic mode of action and an investigation into whether myxobacteria can be cultivated in such a way that they produce more OMVs with a higher cystobactamide content are planned for the future. EVs possess various properties that predestine them for therapeutic use. The efforts presented here towards characterizing them provides the groundwork for a better understanding of these natural vesicles. By using small bioreactors instead of laboratory-scale culture flasks, OMV-producing bacteria could be grown in larger quantities. However, it remains to be investigated whether the antibiotic vesicles can also act on clinically relevant pathogens as well as how they interact with beneficial bacteria like those of the intestinal flora. This analysis needs to be performed in more complex in vitro cell and animal models. 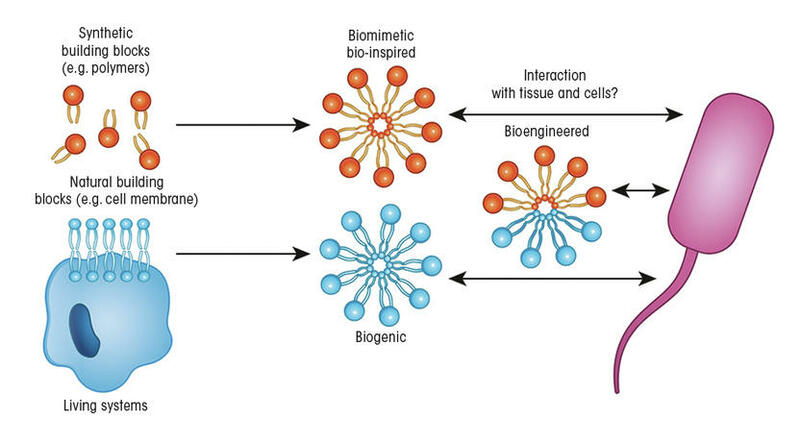 It is also conceivable to combine the natural properties of the vesicles with intelligent biomaterials to expand the range of possible applications . Completely eliminating a source of infection is a major challenge and is urgently needed to prevent new resistances from emerging. Biocompatible and inherently antibiotic vesicles could make an important contribution to achieving this aim. This work was supported by the NanoMatFutur program of the German Federal Ministry of Education and Research (reference number 13XP5029A). The Helmholtz Institute for Pharmaceutical Research Saarland in Saarbrücken is a subsidiary of the Helmholtz Center for Infection Research in Brunswick (Germany). The HIPS was founded in 2009 and is involved in the development of new agents against infections and of therapeutic strategies. As the first research institute in Germany devoted exclusively to pharmaceutical research, the HIPS aims to turn scientific findings into therapy-relevant applications. Its research focus is on the isolation of antimicrobial natural products, synthetic drug design and the development of innovative drug carriers. HIPS’s activities are closely linked with Saarland University.